It wasn't until I hosted a balsamic vinegar tasting awhile back that I really started to learn and appreciate this ingredient. 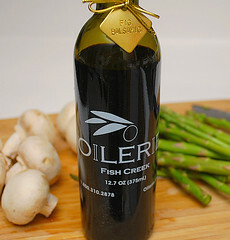 When I received this lovely bottle of fig balsamic vinegar, I knew it would go really well with fish - especially salmon. Taking a recipe I found from AllRecipes, I substituted regular balsamic vinegar with my fig balsamic... and it made for a sweet glaze with a great depth of flavor. If you don't have fig balsamic vinegar, any balsamic vinegar (regular or flavored) will do. 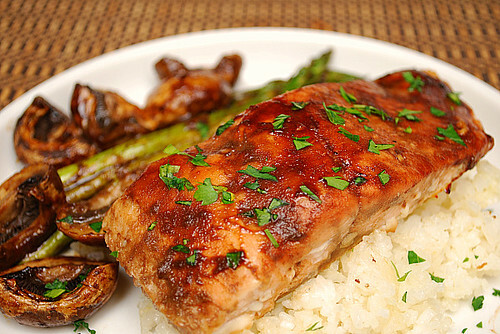 I served my salmon over a bed of garlic rice and roasted asparagus and mushrooms, which I drizzled in some reserved glaze before roasting. Bake in preheated oven for 10 to 14 minutes, or until flesh flakes easily with a fork. Brush fillets with remaining glaze, and season with salt and pepper. Use a spatula to transfer fillets to serving platter, leaving the skin behind on the foil.Garnish with parsley.